Amazon has begun trialling a small autonomous delivery robot on the streets of Washington State. Six Amazon Scout fully-electric small trucks have begun delivering goods to people within Snohomish County, Washington. The delivery robots, developed at Amazon’s Seattle research and development lab, travel along the streets at ‘walking pace’ and only deliver packages to the neighbourhood Monday through Friday, during daylight hours. For the experimental period, the Scouts are accompanied by an Amazon employee. “At Amazon, we continually invest in new technologies to benefit customers. 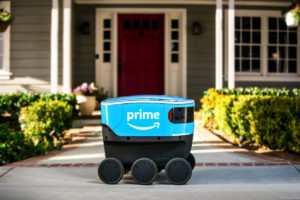 We’ve been hard at work developing a new, fully-electric delivery system – Amazon Scout – designed to safely get packages to customers using autonomous delivery devices,” said Sean Scott, VP of Amazon Scout, in a blog post. Customers living in Snohomish County don’t have to do anything differently in order to get their goods delivered to them by a robot. They simply have to order as normal, through the Amazon app or at Amazon.com, and their packages will be delivered by either one of Amazon’s partner carriers or by a Scout.